all facets of the MG hobby for many years. Over the last 23 years there have been numerous versions of the history behind the MGB V8, but none have ever fairly presented Ken Costello's side of the story. Rumors and opinions have been presented as fact, and innuendo has declared Ken Costello's conversions amateurish. Now is the time to put the record straight and give Ken Costello his rightful position in MG history. 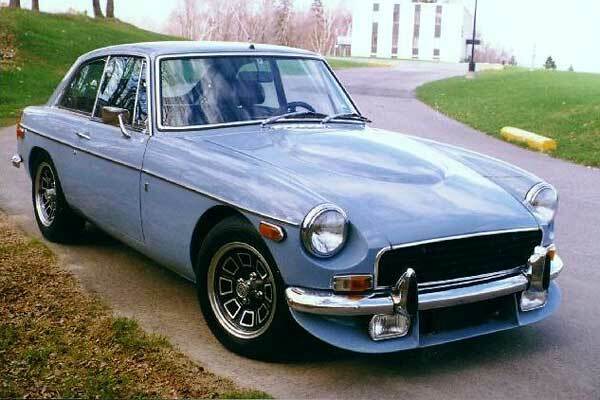 First a brief background on the aluminum engine which made the MGB V8 possible: this 215.5 cu. in. 3531 cc, 318 lb. engine was originally designed by Buick and supplied in nearly a million vehicles during 1961-63. Unfortunately, considerable trouble was experienced due to chemical reaction between the coolant, which was not silicone based in those days, and the aluminum block. When used incorrectly, the coolant led to fouling of the waterways and overheating. Buick dropped the engine from production in 1963. J. Bruce McWilliams, head of Rover USA, was friendly with Karl Kiekhaefer of Mercury Marine and during a visit to his workshop spotted a Buick 215. Rover was looking for an American V8 to power the stodgy Land Rover for the US market, negotiations resulted in a manufacturing license and the success story started. British manufacturers were unfamiliar with aluminum die casting at that time, so the big difference in the Rover manufactured blocks and heads was their being sand cast. This engine has powered many Rover models over the last 30 years, from the Rover 3.5L to the Range Rover. Design development has taken it from 3.5L through 3.9L to the present 4.2L and 4.6L, and from twin SU HIF-6 carbs to multi-port fuel injection. As it is planned to continue using the unit well into the 21st century, this engine could easily become a 50 year success story! Within a couple of months of launching the MGC, it was obvious the car would not be a success. Reviews in the motoring press condemned its handling as a performance vehicle (as an MGC owner I am one of the multitude who thinks this is a grossly unfair assessment) and if MG was to maintain its market position against the challenge posed by the Triumph Stag and Sunbeam Tiger another model was a necessity. In 1970 Charles Griffin, Chief Design Engineer for British Leyland, was instructed to investigate dropping the Rover aluminum V8 unit into the MGB. His production planning team looked at the project for several months and in November Griffin sent a memo to BL chairman Lord Stokes stating "We have investigated the possibility of installing the Rover (Buick) V8 in the MGB and have determined the car would have to be widened at least 3-1/2 inches, obviously this is not feasible." Meanwhile Ken Costello had already solved this "not feasible" problem without widening the car! How did this come about? It is necessary to know something of this tenacious little Englishman. Ken was born in Kent, the outer SE suburbs of London. At age 18 he graduated from Woolwich Polytechnic, where he had studied auto engineering, and started work at the Motor Industry Research Department on the Great West Road in Brentford, Middlesex. In 1959 a friend with a Mini which was his 'daily driver' told Ken, "If you tune this you can race it", and so the road to the MGB V8 was started. Ken tuned the Mini, drove to Castle Comb race track, and entered his first race in the Special Saloons Group 3 classification. He won and set a lap record! Now he got serious, thoroughly rebuilt an 850 cc mini and lightened it with fiberglass doors etc. ; he was very successful., setting lap records at Brands Hatch, Mallory Park, Castle Coombe, Crystal Palace and Snetterton (where he was timed at 129 mph). The car was so fast he was put in the upper 1200 cc class and still consistently won. One day in 1962, while driving on the M1 motorway. Ken had a dust up with a Mark II Jaguar, impressing its driver. When they stopped for petrol Ken discovered his opponent was a Jaguar salesman at Cripps Brothers, a Leyland dealer in Sidcup, Kent. The salesman introduced Ken to the Lady Peggy Cripps, owner of the dealership, and within a couple of weeks he was running her 'Special Tuning Division' along with racing for her. The car was a 1275 Mini bored to 1293 cc. On one occasion at Brands Hatch it was reluctantly allowed into a 1330-2000 cc race which Ken easily won. In spite of the win he was told it must be over 1300 cc to be in the Championship race! Ken bored the block to 1304 cc and entered. Just before the race he was made to remove the head in the scrutineering bay so the bore could be measured. Later, as he sat on the grid in pouring rain, Clerk of the Course Nick Syret, told Ken "this is probably the only car checked in case it was undersized!" Ken won the championship. Over ten years he took part in over 400 Saloon races with several cars including a Broadspeed Ford Anglia owned by Laural Ward. His next step was Formula 3 when Cripps bought the ex-checkered flag Brabham BT 20 with a Cosworth MAE 1000cc engine. 1966/67 saw Ken earning a lot of money driving this Brabham for the movie Grand Prix. He has many stories about this experience but one in particular is memorable: Yves Montand was being filmed in the cockpit of a race car as it was towed, at speed with its front wheels removed, behind a Ford GT-40 containing the camera. Obviously Yves Montand had no control over the car and as he was towed at very high speed round a bank his face drained of color and his bladder opened! This shot is in the movie as his car supposedly crashes! While filming at Monza Ken visited the museum there, he was intrigued by a small block Maseratti V8 engine and the seeds were sown for a 'really fast' small car. Back in England, after filming was completed, he happened to spot a Rover V8 on the floor of the workshop at Pipers Garage in Hayes, Kent. After mulling it over for a while he borrowed a red MGB roadster from an Insurance Assessor friend, bought a used Oldsmobile 215 engine and set to work. By the end of November 1969, after six months of trial and error, the car was running and the enormous potential became obvious. The next car converted was a GT, owned by Lady Cripps, with several improvements including the rear axle from an MGC. The performance was incredible. Ken took the plunge and went into business for himself, opening premises in Farnborough, Kent with 8 employees. The V8 Conversion Company was born. Customers would supply the car which Ken and his mechanics would convert using a Rover P6 engine and standard MGB gearbox. 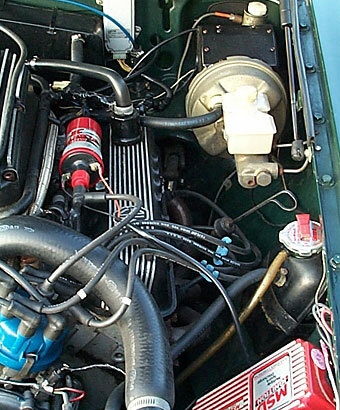 The cars were easily identified by their unique egg-box radiator grille, Jensen alloy wheels, Costello V8 tail-badge and hood with a round bubble to accommodate the carbs. The February/March 1971 issue of "Motoring News" featured a road test of Ken Costello's MGB V8, hailing the car as a breakthrough in performance for sportscars. A comparison of performance figures illustrates the huge improvement over the 1800cc MGB. could possibly see your way clear to arranging for us to have such a vehicle on loan for a day or two. or write me at the above address, in order that suitable arrangements can be made. Ken telephoned Griffin and told him he didn't have a car available, but would call at Longbridge as soon as he did. Several weeks later Ken turned up at the factory without an appointment and asked for Charles Griffin. "Do you have an appointment?" he was asked. "He's too busy to see you without an appointment." "Tell him Ken Costello is here with his V8 MGB." A couple of minutes passed while the guard phoned Griffin. "He will be down in a minute." Charles Griffin arrived almost immediately, accompanied by several members of his staff, including Harry Webster and George Turnbull. The car was whisked away and driven around the test track while Griffin and Ken chatted over lunch. After an hour the car was back and an impressed Griffin told Ken "This is a first class job, how can we help you?" Ken's concern was crown wheels and pinions, so he asked "How many 3.07:1 crown wheels and pinions are available now that MGC production has ended?" "I will check and see what stock we have." Griffin replied. A week later Ken was asked to take the car to BL head office in London's Berkeley Square so the Chairmen Lord Stokes could see it personally. After he had taken a short drive he asked Ken "What will you do if we produce this?" "I'll keep on building them because it will take you two years to get into production", was Ken's reply. In late 1971 a brand new LHD harvest gold MGB-GT and Rover engine arrived from Abingdon with a request to fit the engine into the car. Two weeks later Ken personally delivered the converted car to Special Tuning in Abingdon. (BL never paid the £1000 invoice for the work). The MG engineers examined the car closely and, excited by the prospect of building their own version, forged ahead with a prototype, and in August 1973 launched the MGB GT-V8. A couple of weeks before the launch Ken took out the only advertisement ever for his conversions, it sarcastically warned customers to "be aware of imitations"! Lord Stokes immediately sent a directive to all dealers instructing them not to sell any new V8 engines without an old unit in exchange, a thinly disguised effort to cut off Ken's supply of engines. Ken, knowing Belgium had imported a lot of Skylarks and Cutlasses, sent a truck over and after several weeks scouring junk yards returned with 40 Buick and Olds blocks which were rebuilt with Rover parts. But with the availability of factory cars, and the cheaper price tag, Ken's customers shrank to a trickle. In all Ken reports converting approximately 225 MGB's during the 70's of which approximately 25% were roadsters, one was an automatic LHD for a Canadian customer (this car was at MG 92 in Peterborough. Ontario) and one was an MGC. It should be remembered that during the development work MG made a number of changes to the MGB to enable the shell to take both the V8 and standard 1800 engines. These changes have made present day conversions a much easier project than that faced by Ken Costello. Engine mounts were modified, radiator moved forward, twin electric cooling fans added and radiator duct panel redesigned, oil cooler mounted under the radiator duct, inner wheel arches were recessed to accommodate specially cast exhaust manifolds, rear bulkhead reshaped to take V8 bell, steering shaft lengthened to move the knuckle joint away from exhaust manifolds, steering column shortened, A-arm bushings up-rated, brake servo added, rear wheel brake cylinders and front calipers enlarged, hood profile reshaped to accommodate the SU carbs, with specially designed air cleaners, mounted on a new plenum. Several changes were also incorporated in the engine including a reshaped sump, oil cooler remote plate, new alternator cradle, shorter pulleys and water pump, and MG rocker covers. Obviously MG expected to sell a lot of cars but "unfortunately the launch corresponded with the gasoline crisis and the trend towards more economical vehicles." That has always been the official line but recently new information has shown that in fact the car's short production run was the result of BL's upper management being run by Triumph men. MG produced seven LHD USA spec MGB V8 GT's which were shipped to this country for certification by the Department of Transportation (one of these is owned by Lyle York in Indiana). MG planned to revitalize sales in this country by producing the V8 in large numbers for export. The official story has always been that they were never certified due to MG not agreeing to crash test the required number of vehicles. This turns out to be untrue, the MGB-GT-V8 was Type Certified by the US Department of Transportation. What stopped its export from the UK was BL's decision not to create competition for Triumph models, including the TR-7 which was about to be launched! Imagine what the response would have been to the MGB V8 in this country! MG would probably never have closed down and there would probably have been as many as 100,000 V8's produced. Production ceased after only 2591 cars. Ken Costello, never being one to rest on his laurels, had already decided on a new direction. During the late 70's he sold The V8 Conversion Company, set up a comprehensive workshop on his property in Sidcup and turned to a new challenge. The standard MGB gearbox wasn't strong enough for the V8 torque. It was always a weak point on both conversions and factory cars. Ken had looked for an alternative and quickly discovered there wasn't one easily available in the UK. He turned his attention to the design of a strong five speed unit. Simplicity was the key word here along with low production cost. Ken's design qualified in all those areas clam shell case that could be opened with just two allen keys, separate bell housing and gears cut the opposite way to the norm. The Costello 5 speed is small, strong and easy to service, can be fitted to either the 4 cylinder or V8, removed from the car, opened and inspected, and then replaced in an hour. In spite of all the advantages the box has been a victim of British industrial stagnation, bank shortsightedness and mismanagement, therefore never entering full-scale production. In the late 1980's Ken beat Rover to the punch by converting MGB's to fuel injected V8 power, with several cars running in Britain and one in the USA, more than two years before the RV8. 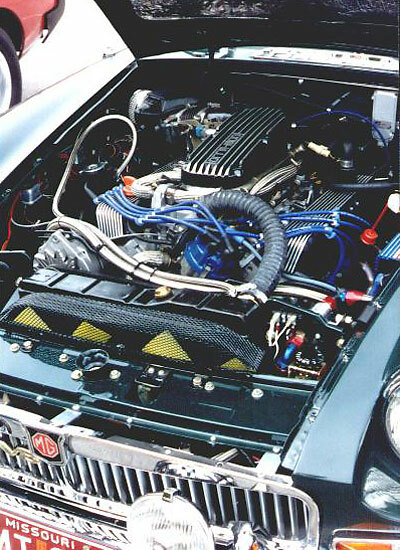 He took the standard Range Rover Lucas multi-port injection system and modified it to fit neatly under the bonnet of an MGB. To accomplish this he designed and manufactured a plenum which not only allows the standard bonnet to be used without modification but can be adapted to either RHD or LHD cars. Along the way, Ken also designed an ABS brake system for the MGB and a heater fan that really will keep the windshield clear! A new front suspension design is in prototype stage and who knows what Ken's fertile and innovative imagination will come up with as he shows no signs of slowing down after more than 40 years in the auto industry. 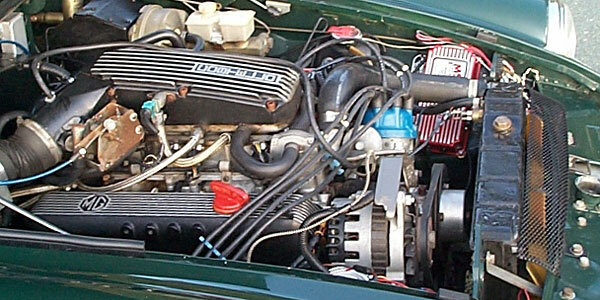 A second example installation of Ken Costello's fuel injection system on a North American MGB. When Ken Costello converted that first MGB he began a historical journey that resulted in the re-introduction of the MG Marque with the MGF. 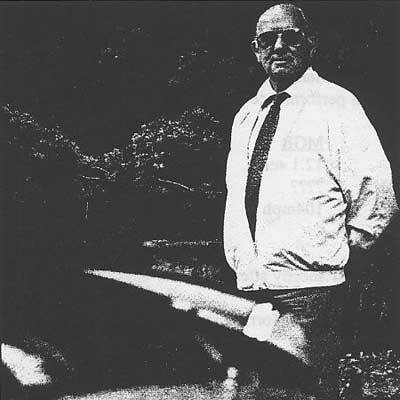 Without Ken Costello there would certainly be no MGB GT V8, therefore no MG RV8 and no MGF. The MG world owes him a debt of gratitude and recognition as a major figure in the history of the marque of friendship. When we originally published this article, we illustrated it with the black-and-white photo above. Additional color photos for internet republication have been graciously supplied by frequent British V8 contributor Jake Voelckers. BritishV8 Magazine has assembled the largest, most authoritative collection of Costello V8 information you'll find anywhere. 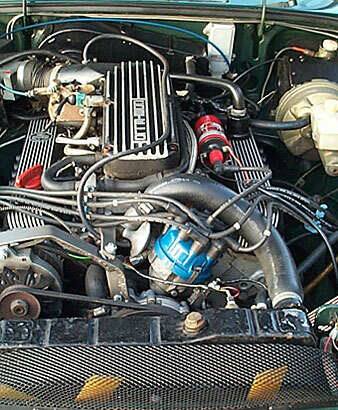 Access our Costello V8 (and "factory" MGB GT V8) article index by clicking here.